I gained a total of 23kg when I was pregnant with my girl and lost a total of 18kg (over a period of 1.5 years) after giving birth to her. The last 5kg was really difficult to shed and just when I thought I've got an exercise regime in place to target it, I discovered that I was pregnant again. A few weeks before I gave birth! 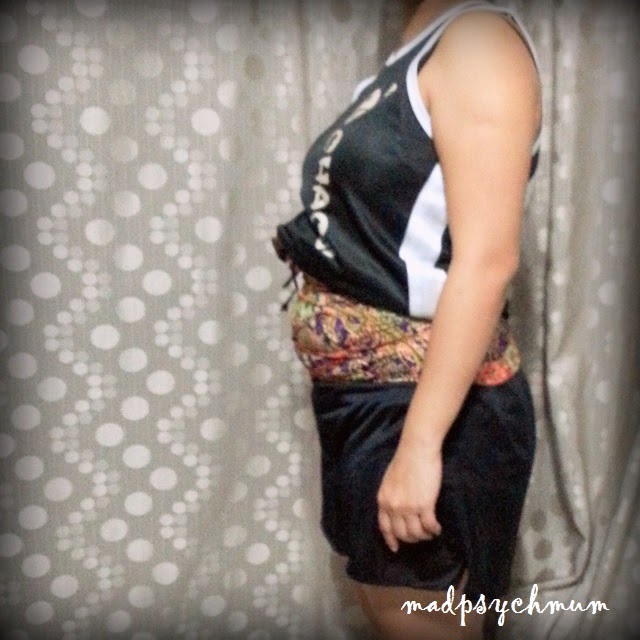 I tried hard to watch my weight when I was pregnant with my boy. I know it's hard to believe since I look so big but I really tried to eat normally, not to snack so much and eat more fruits whenever I felt hungry. I kept myself active as much as possible, walked as much as I could, visited 2 zoological parks and 3 theme parks during my pregnancy and even took regular prenatal pilates classes. I was walking around in a shopping mall in active labour, 3 hours before I gave birth for crying out loud! I started the process by getting Jamu massages like I did for my previous pregnancy (which proved to be helpful to me). As my therapist massaged, I could feel my cellulite screaming (hurt like crazy let me tell you) and the water retention getting squeezed out. She also applied some sort of ginger paste on my tummy and bound me with a horrendously tight Victorian torture device (also known as a binder), which I had to wear for 8-10 hours everyday while sweating and peeing out as much water as I can. It was quite a torture but one I was more than willing to endure if it can result in a flatter tummy. I could already see results immediately after the first session! After each session, my tummy started to decrease gradually and by the last session, it had shrunk to more than half the original size (of course I took a picture of the end result but no, I'm not sharing it here! *laughs*)! I had also lost a total of 13kg (granted about 4kg is the weight of the baby but still) by the end of the last session. 13 down, 15 more to go! After the 1 month confinement, I couldn't wait to get out of the house as much as I could! I continued my favourite activity of window shopping at various shopping malls while updating my Nursing Room Review page at the same time. I think a combination of breastfeeding my baby and walking while carrying him in the carrier were the reasons why I was able to lose more weight. I even took part in the Terry Fox Run with my baby. By the time I started part-time work after staying home for 2 months, I had lost another 3kg. 16 down, 12 more to go! 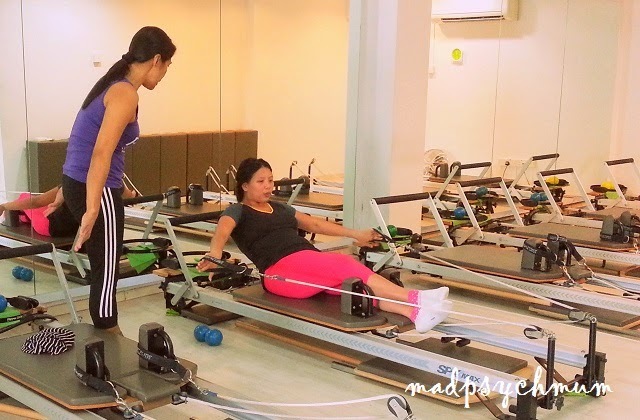 After I returned to work, I also started weekly Pilates classes at Pilates Fitness to improve my posture, strengthen my muscles and most importantly, lose weight! My personal favourite is Jumpboard and you can read more details of my review of Jumpboard here. 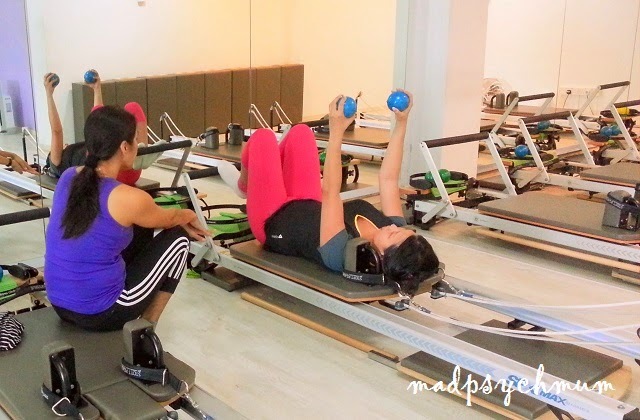 And surprisingly, even though I'm working my muscles more than I had ever done before, I'm still addicted to Pilates! I've been doing Pilates religiously for twice a week for 3 months and what do you know, lost another 3kg! It may be a small weight loss but to me, it's great progress because I still eat normally and have that dessert every now and again. I think slow and steady weight loss is healthier because you gain muscles rather than just lose water. I'm also a lot more flexible and toned overall. Some of you may think the sessions are rather expensive and I don't disagree with you. But look at it that way, it is actually the same, if not less, than meal replacement drinks or a slimming package at a slimming centre but you don't experience the same level of fitness. 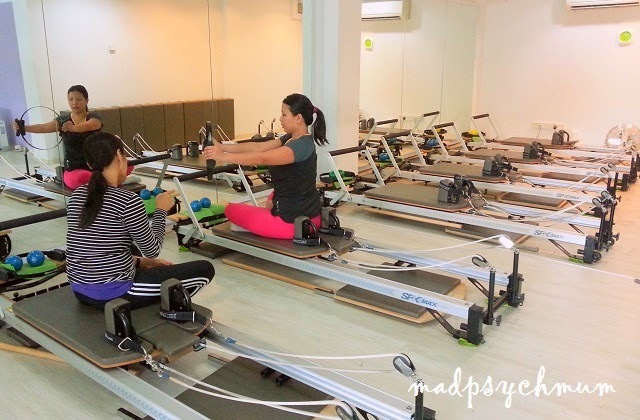 If you would like to try out Pilates, the giveaway for one free Pilates class (worth S$49) is still on till 30th June 2014 (Mon)! Please click on my previous post for more details. 18 down, 10 more to go! Disclosure: Complimentary Pilates classes were received from Pilates Fitness for the purposes of this review. I liked it so much I purchased a package to continue doing Pilates with Pilates Fitness at least once a week. No monetary compensation was received; all opinions are my own.